I've been wondering what to read next. I'm going to work through Come Thou Long Expected Jesus again during Advent but wanted something to fill in the weeks between now and December. So I went to my husband's bookshelves and settled upon Growing in Christ by JI Packer. 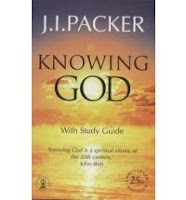 I started in on the introduction to read that Packer himself described Growing in Christ as the companion volume to the classic Knowing God. And I read no further. It is time to read Knowing God. It's one of those books on everyone's list of top ten MUST READS. I've tried to read it in the past without success. Now is the time. I'm three chapters in and it is brilliant! Here's a bit I read a couple of days ago. One can know a great deal about God without much knowledge of him. I am sure that many of us have never really grasped this. We find in ourselves a deep interest in theology (which is, of course, a most fascinating and intriguing subject - in the seventeenth century it was every gentleman's hobby.) We read books of theological exposition and apologetics. We dip into Christian history, and study the Christian creed. We learn to find our way around in the Scriptures. Others appreciate our interest in these things, and we find ourselves asked to give our opinion in public on this and that Christian question, to lead study groups, to give papers, to write articles, and generally to accept responsibility, informal if not formal, for acting as teachers and arbiters of orthodoxy in our own Christian circle. Our friends tell us how much they value our contribution, and this spurs us to further explorations of God's truth, so that we may be equal to the demands made upon us. All very fine - yet interest in theology, and knowledge about God, and the capacity to think clearly and talk well on Christian themes, is not at all the same thing as knowing him. We may know as much about God as Calvin knew - indeed, if we study his works diligently, sooner or later we shall - and yet all the time (unlike Calvin, I may say) we may hardly know God at all. These words were ringing in my ears all the day after I read them. And I woke up the next morning still thinking about them and feeling slightly ill. Deeply convicted, I've prayed and I've pressed on. And I've been challenged and convicted, and yet nurtured and fed. All in three chapters. Knowing God along with Come Thou Long Expected Jesus will see the year finished well. Thereafter I hope to go back and read beyond the introduction of Growing in Christ and then tackle John Owen's Communion with God, thanks to Jean's recommendation. It's been good advice to read short and well - a few short minutes, say fifteen, every day from well chosen titles - which can see you through a handful of good books each year and greatly enriched as a result. Thanks Jean Williams and John Piper for the good encouragement. When friends have babies I often pray that the newborn would never know a day in their life when they don't know that God is their loving Father in heaven. I have prayed that prayer many times. And not only for newborns. I continue to pray this for various children, including our own boys and our godchildren. I have been reflecting on how I became a Christian lately. And I have heard my husband talk about his journey as a Christian a couple of times during the last week as well. We share quite similar stories. At one level there was a defining moment for me. It was 13th August 1987, about 4pm, sitting by the river. Ironically I skipped a lecture, the only lecture I EVER skipped at university*, to sit by the river to talk to God and give my life to Him. I remember it as clear as day. Yet despite this very particular moment, I have always know God as my Father in heaven. I cannot remember a time when I did not acknowledge and love God. My parents didn't go to church but they did send my sister and I to Sunday School each week. And God in His providence always surrounded me with people who loved Him, even after the days of Sunday School - teachers, friends - there was always someone there asking a hard question, keeping me thinking, encouraging me along and as I now know, praying for me. As a child my relationship with God was vibrant. In my teenage years that relationship lost some of its vibrancy. But I never lost a sense of God. It was more a case of Him being in heaven and me being here in my life on earth. Distance...but I never turned away. And as I have heard my husband say twice in the last week of his story, while I can pinpoint an exact moment when I put myself under God's authority, it is actually hard to discount the nearly twenty preceding years when God continued to be very real and it was only my (I now understand) sinful pride that kept me from fully apprehending what it means to be a child of God. I still had a relationship with God and He was very much at work in my life, even if I didn't fully grasp it. I realised this week that during my first 20 years I lived the very prayer I pray for newborns. There has never been a day in my life that I didn't know that God is my loving Father in heaven. And for that I am deeply thankful. But it took 20 years, a handful of faithful people who prayed for me and kept badgering me and also a series of events that gradually eroded my confidence in the things in which I had previously placed my security to understand that that God is my loving Father in heaven and Jesus is my friend, Lord and Saviour. And I need both, not just the first. So this week I am praying a better prayer for our boys and for our godchildren and for the various other children who are often found in my prayers, that they would never know a day when they don't know that God is their loving Father in heaven and that Jesus is their friend, Lord and Saviour. This seems to be a better prayer. Eating...nothing. But looking forward to corned beef with bechamel sauce and veg for tonight's dinner. Feeling hungry...because the corned beef smells delicious! Drinking...water. Just did an hour or two of weeding and now I'm a bit thirsty! Reading...Isaiah, the 80s Psalms and Acts from the Bible. 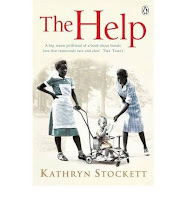 Also reading...The Help by Kathryn Stockett. A friend gave me a copy for my birthday WAY back in January. I tried to read it during the summer but just couldn't get on with it at the time. I think I had just finished with the Nancy Guthrie books at that point and nothing was going to be satisfactory after that. But I am LOVING it now. It's on at the movies. If I get to see it that will be a bonus but I'm enjoying the written version immensely. 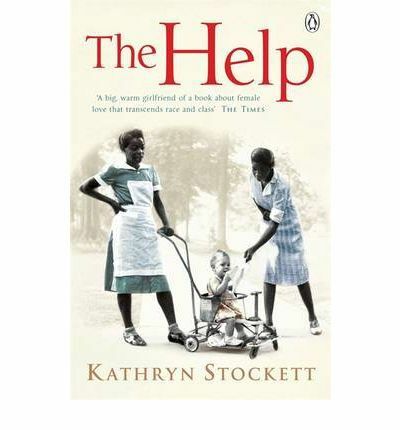 Between Feminine Threads and The Help I also read Daughters-in-Law by Joanna Trollope. I was given a copy of it at exactly the same time Wendy reviewed it here and having been so thoroughly captivated by Feminine Threads, I knew from experience (ie. from my summer experience with The Help!) to follow that experience with something a bit lighter. I've read Trollope before, including The Rector's Wife! She spins a good story - always an enjoyable read if you just want to enjoy the story and don't want to have to concentrate too hard - and she is a master of characterisation. Listening...to John Piper's sermon "Holding Fast to the Word of God in 2010" once again. I've listened to it a couple of times in the last month, more for the joy of listening to Piper read all of Philippians out aloud at the beginning. But the sermon that follows, on the importance of daily Bible reading, is wonderful too. Wondering...if it is time to put an audio version of the Bible onto my MP3 player? I'm a visual learner. I usually don't find just listening to the Bible all that satisfactory. But having pulled out the John Piper sermon (above) to hear him reading out Philippians, I am wondering if I'm entering a new phase? Interested in...some new sermons to download. I have been enjoying John Piper and Tim Keller this year. Has anyone listened to anything really great lately that they can recommend? Enjoying...the view outside my kitchen window. Also enoying...the school holidays. Term three was very busy at lots of levels so it is nice to slow down for a while. And making a mental note to self to never start a month by saying, "This month should be fairly pedestrian." We managed a week of pedestrian at the beginning of September before we found ourselves transported from the footpath to the freeway. Looking forward...to celebrating three birthdays in the family this week. There would have been a fourth but he and his family find themselves celebrating his birthday in Paris this year. The rest of us will enjoy a delicious lunch and a browse at the Book Caffe. Thanking God...for His goodness and remarkable care of us this last month in so many ways. Also thanking Him for the adults who genuinely love our boys, not because they have to by association, but because they really do love them in their own right. And speaking of those boys, so very thankful to God that they are growing up to be such interesting, wonderful young men. Looking at the time...and realising it is time to hit PUBLISH so that I can make my bechamel sauce and prepare some vegies.